PT Astra International Tbk – Daihatsu Sales Operation (DSO) or most commonly known as “Astra Daihatsu Sales Operation (AI DSO)” is a reputable automotive company in Indonesia under PT Astra International Tbk (Astra Group), the largest business conglomerates in Indonesia. Astra Daihatsu Sales Operation is a corporate operation of Astra Group which engaged in sales and after sales of Daihatsu cars in Indonesia. Astra Daihatsu Sales Operation main business focus on distributing of Daihatsu cars manufactured by PT Astra Daihatsu Motor (ADM), consist of Ayla, Gran Max, Luxio, Xenia, and Terios. Astra Daihatsu Sales Operation also markets Daihatsu Sirion which imported directly from Malaysia. In Indonesia, Daihatsu is widely known nationwide as the second-largest automotive brands after Toyota. Daihatsu maintains 15.3% of the cars market in Indoensia According to Astra Group’s Annual Report 2014 as cited by JobsCDC.com, Daihatsu reported total car sales of 185,226 units in 2014. 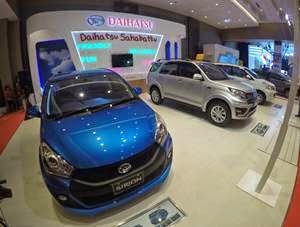 Daihatsu now has 216 outlets spread in all over Indonesia. Its outlets include 136 vehicle, service, parts (VSP) outlets and 86 vehicle (V) outlets. Not more than 27 years old. Min. holds Bachelor Degree/S1 in major Accounting, Management, Finance from reputable universities with GPA min. 2.75 within 4.00 scales. Willing to be relocated throughout Indonesia. Candidates must possess a potential leadership. Hard work and have high interest in automobile industry. Have a good basic accounting skill. Min. holds Bachelor Degree/S1 in major Electronics Engineering, Mechanical Engineering, Industrial Engineering from reputable universities with GPA min. 2.75 within 4.00 scales. Have high interest in automobile industry and workshop area. Min. holds Bachelor Degree/S1 in any field from reputable universities with GPA min. 2.75 within 4.00 scales. Srong passion in direct selling and have interest in automobile industry. Past experience in the field of sales will be an advantage.